الخيار الأفضل للحصول على المتعة والاسترخاء، فندق ذا دارلينج يقع في منطقة رائجة من أفضل مناطق المدينة. يمكن من هنا للضيوف الاستمتاع بسهولة الوصول إلى كل ما تقدمه هذه المدينة النابضة بالحياة. يضفي محيط الفندق اللطيف وقربه من أكثر المعالم السياحية جذبًا سحرًا خاصًا على هذا الفندق. إن فندق ذا دارلينج حريص على توفير الراحة للنزلاء، فلا يوفر الموظفون جهداً في تقديم أفضل الخدمات وضمان حسن الاستقبال. يقدم الفندق فرصة للاستمتاع بشريحة واسعة من الخدمات بما فيها: خدمة الغرف على مدار الساعة, كازينو, مكتب الاستقبال على مدار الساعة, مرافق مخصصة لذوي الاحتياجات الخاصة, تخزين الأمتعة . بالإضافة لهذا، تتضمن كل غرف الضيوف مجموعة واسعة من وسائل الراحة . بعض الغرف توفر حتى تلفزيون بشاشة مسطحة, سجاد, قهوة فورية مجانية, شاي مجاني, غرفة ملابس لإرضاء أكثر الضيوف تطلبًا. كما أن مجموعة الخدمات الواسعة الموجودة في الفندق لضمان راحتك تترك لك الكثير من الخيارات لقضاء وقتك أثناء فترة إقامتك. مهما كانت أسبابك لزيارة المدينة، فإن فندق ذا دارلينج هو الخيار الأفضل لإقامة مثيرة وممتعة. يُرجى العلم بأن الأطفال دون عمر 18 عامًا لا يستطيعون الإقامة في هذا الفندق. يطلب العقار مبلغ تأميني يُسحب من بطاقتك الائتمانية قيمته 200 AUD في ليلتك الأولى من الإقامة، ثم مبلغ 100 AUD لكل ليلة بعد ذلك. يغطي المبلغ التأميني المصروفات النثرية أو التلفيات التي قد تحدث، ويُسترد هذا المبلغ بعد تسجيل الخروج والتأكد من عدم وجود أيًا مما سبق. ستؤثر المبالغ التأمينية المسحوبة على رصيدك الحالي لمدة تصل إلى 10 أيام عمل، ويعتمد ذلك على المؤسسة المالية التي تتبعها. نظرًا لإجراء أعمال الاختبار والصيانة التي تمت في The Star Annual Services Essential Day يوم 28 مايو 2019، يتم تغيير وقت تسجيل الخروج إلى الساعة 8:00 صباحًا. يتعين على النزلاء المقيمين طوال اليوم مغادرة الغرف قبل الساعة 08:00 صباحًا. سيتم تسجيل الدخول والوصول إلى العقار بعد الساعة 03:00 عصرًا. I stayed here for 4 days. It was such a wonderful hotel as I expected. But there was a renovation for the hotel when I arrived and I had to stay in the Astral residence which was a lot nasty. But all the staff at the darling were so experienced that I could visit many places easily. The facilities, amenities, even breakfast were also great. Ten minute walk to Darling Harbour and harbourside restaurants. Twenty minute walk to the shopping centre, 15 minute nite walk to Pyrmont Wharf where you can take a ferry to circular quay then a further ferry to Manly Beach . A wonderful 5 star luxury hotel which is perfectly located on the edge of the harbour. 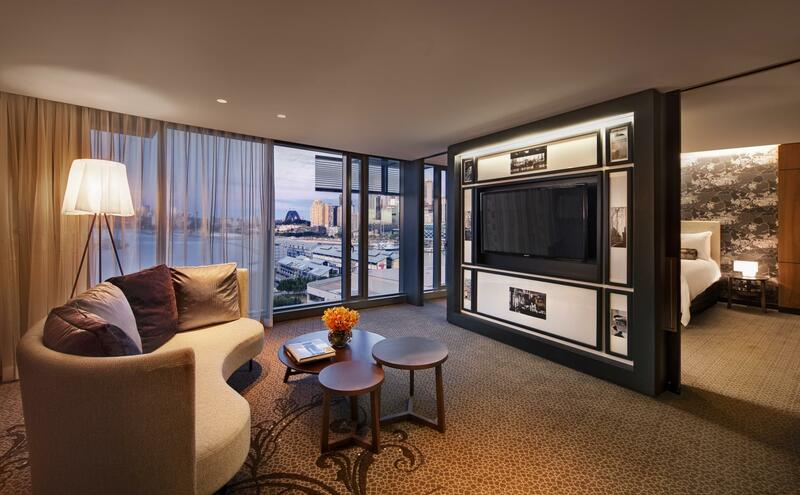 We enjoyed a beautifully appointed room on the 15th floor overlooking the Harbour Bridge and surrounds. Very courteous staff and impeccably clean room. The three choices of mood lighting for different times of the day a great feature. Look forward to regular stays in the future. Staff were excellent knew us by name and did everything to make our stay enjoyable. Has an outside pool, and a few rooms with twin beds if required. The best location in Sydney CBD. Good breakfast could give you enough energy to travel around Sydney. Patient staff work there, would give you a unforgettable service. Alright, I suppose this hotel is one of the best hotel in Sydney. I consider myself to be extremely fussy, frequent traveler. Staff are fantastic, extremely helpful, not invasive. I needed directions a number of times and it was normal for them to walk me outside to assist in correct directions. Checking in & checking out was a breeze & professional. Rooms Clean!!! I will be comming back & have recommended this to my friends, some have already stayed and feel the same. Thank you to all the staff here, I am looking forward to my next visit. Stay here a lot 4 times this month however we heard someone through the night pass gas, was to embarrassed to call the front desk at the time about it. 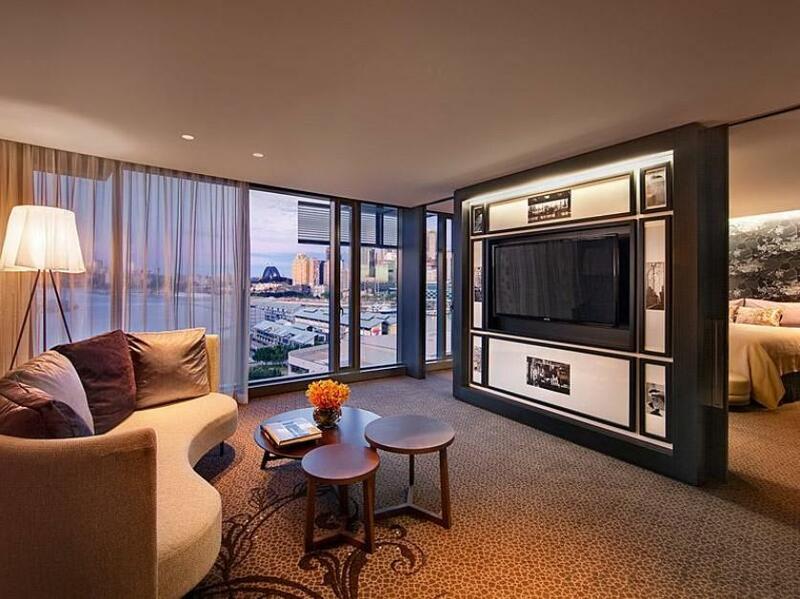 Other then that it’s the best hotel in Sydney with the best service. Had an amazing time at this hotel! Staff was very nice, and very quick at solving any problems! Room was clean and spacious, the bed was amazingly comfortable! Definitely will recommend, great to spoil yourself! Excellent room. Very large, clean and great mini bar options. From the moment we walked in the lobby till we ended our stay, absolutely everything was perfect. We were provided a complementary room upgrade and and the most outstanding service by every staff. Best value for money accommodation I have come across. Highly recommend to anyone travelling within Sydney. I booked my visiting brother and his wife from USA, into the Jewel Suite for an extra special surprise anniversary gift. The staff were amazing and made their visit really special. Upgraded to the Jewel Spa Suite, views were spectacular, Annabel perfect host showing functions of suite. After I left they sent a bottle of wine and fruit to the room. Superior Class Hotel and Staff. We were upgraded to a Stellar Suite - it was simply opulent!!! Spectacular harbour views, first class amenities and superb room. The reception staff were absolutely first class!! Thank you for a most memorable stay. We got upgraded to Jewel Suite. It was such an awesome experience. Room is clean, free water and fruit platter. We were well rested as the bed had the right firmness. Staff are always ready to help and were very attentive to my needs. Would definitley recommend this hotel. Great service and a beautiful hotel. On checkin I was upgraded to a suite and what an amazing room it was. Omg. A stunning view. Best room I’ve ever stayed in. The hotel is perfectly located with coles and many cafe Within a min walk. Darling hourbour just a 2 min walk. The pool is great. The Darling is a wonderful place to stay whilst in Sydney. Part of The Star complex / Lyric Theatre. Quick ride on the Light Rail or an easy walk, via Pyrmont Bridge to/from the city. Try the HARVEST Buffet (breakfast). One of the best buffets anywhere in the world, that I have had the pleasure to dine at. It was that good! A credit to Management & Staff. Many thanks for a most enjoyable visit. We booked this for our wedding preparation and day after wedding. Staff was so friendly and excellent. Providing quick service for everything we requested. Also gifted us with a bottle of champagne to congratulate us on our marriage. A wonderful three nights sweet bed stayed, have a polite friendly receptionist with perfect guild us to the room. 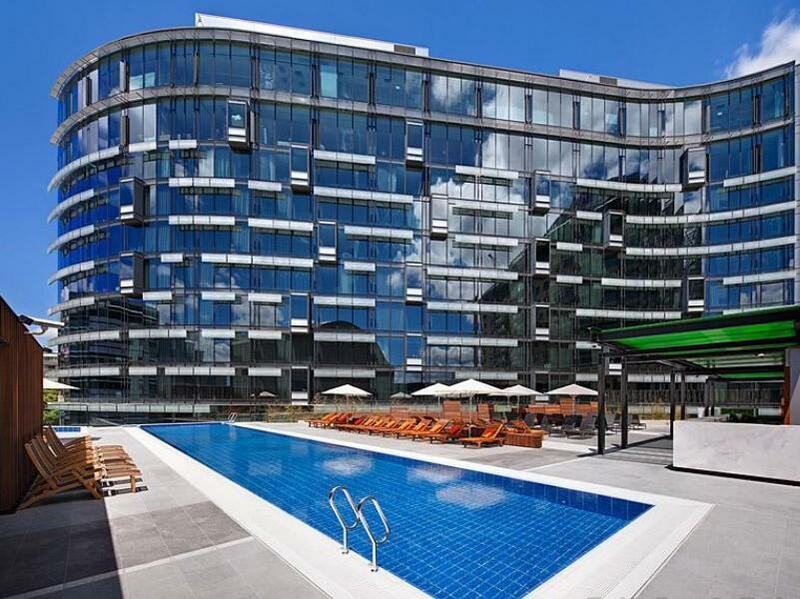 Just a short walking distance to darling harbor. 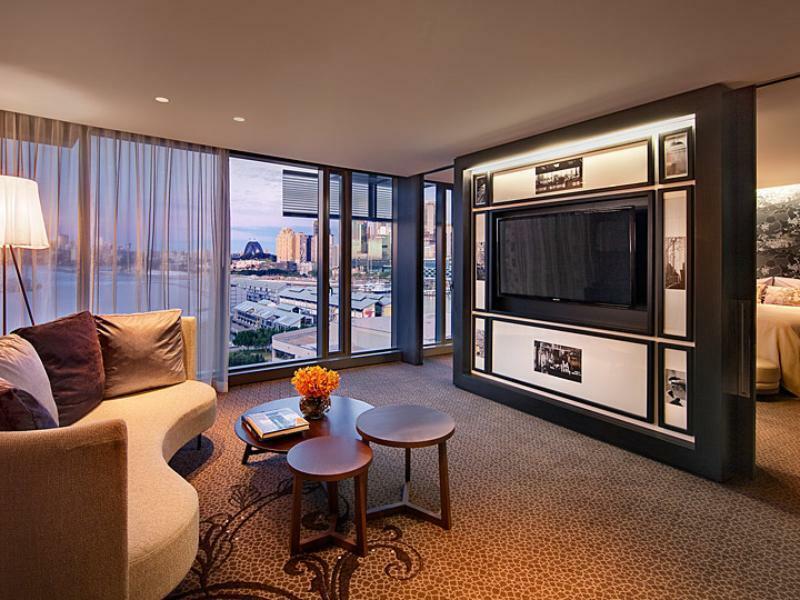 The darling is one of the best hotels in darling harbor area. It is close to everything either by walking or bus. The staff of the hotel are very friendly and nice. 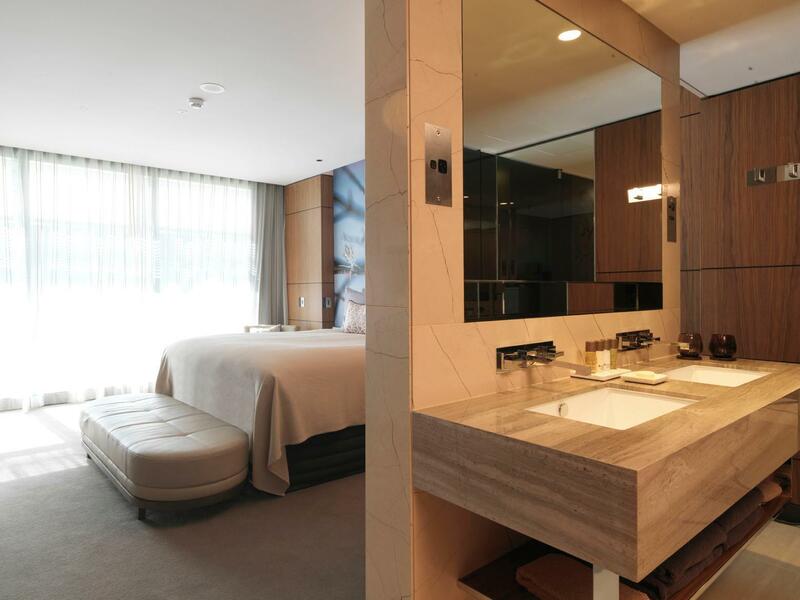 The rooms are clean and the housekeeping do a great job every time it is requested.